I am very grateful to work for a tech company that places such a high value on community service. Bronto and its parent company NetSuite give each employee 16 hours of paid time off to be used towards volunteering at either some Bronto-sponsored charities, or other charities of your choice. Yesterday I volunteered with a mixed group of 10 engineers, marketers, and sales reps went to Urban Ministries of Durham to do things like sort through clothing donations. 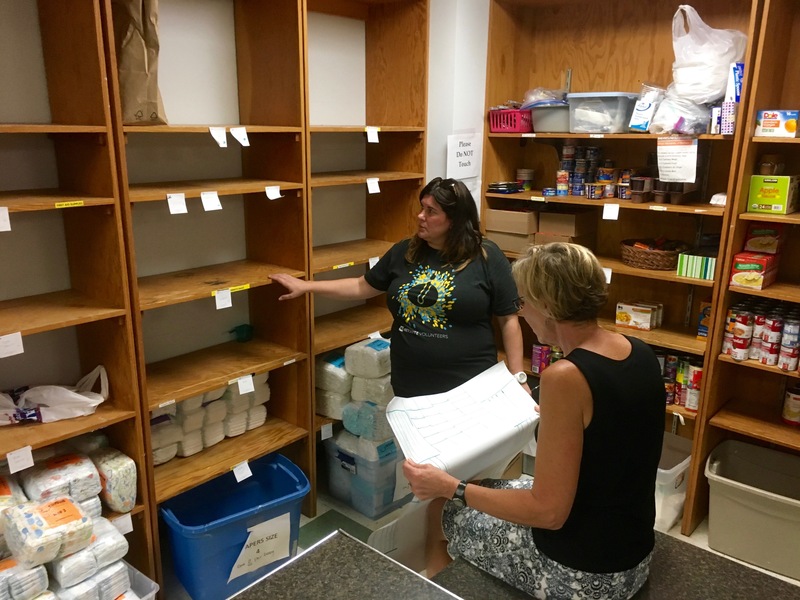 I ended up in a small group with two of our kickass engineering project managers, Laura Bowman and Rebecca Larkin-Martinez, and we were tasked with something different – to design and document (but not implement) a re-organization of the food pantry. 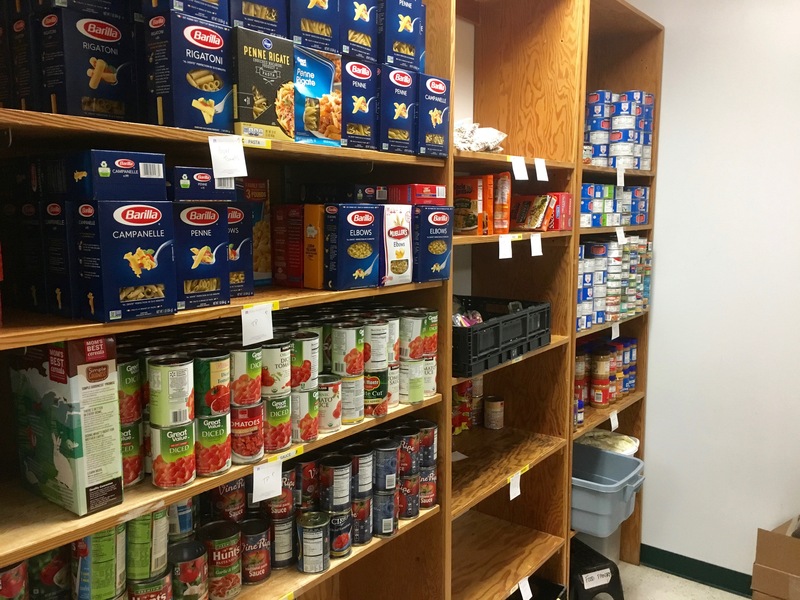 Gin Jackson, Director of Community Engagement, explained to us that instead of the usual re-stocking of the pantry, we’d be addressing some recent challenges with meeting the needs of UMD’s clients. In contrast to the donation list, donors had been giving items with no category (like granola bars, ketchup, raisins). Volunteers resorted to making a place in the corner of the pantry called “Crazy Shelf” with no defined process for giving out any of those items. Most of these items ended up in storage and then in the trash. Which means that how those items are stored and organized in the food pantry needed to be updated. Second, here is a mixed list of both the existing and the new items that will be accepted and need a place to live. We had to use a colored marker to signify what on the list was net-new. But the most important information we got was about the food pantry users. Even though the three of us had not ever worked as a group before, we got along well. 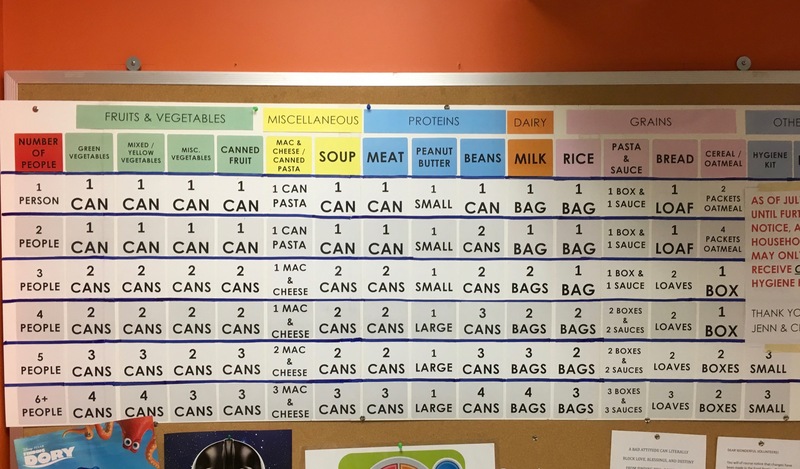 Each of us spent a few minutes walking around the pantry, looking at the existing cans on the shelves, the labels, the height between shelves. We eventually realized that merely talking it out wasn’t going to be enough. Looking at the piece of paper with all the new items and then looking around the room was overwhelming. We needed tools and processes. 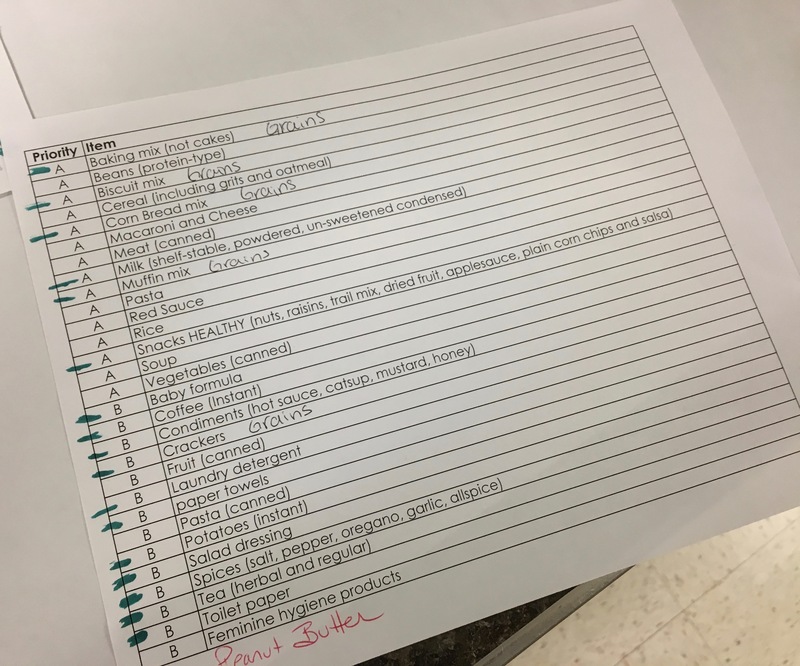 Back in August my wife and I attended an ExploreUX Raleigh meetup called “A Day in the life of an Information Architect.” Amongst other things, Julie talked about cart sorting. That took awhile. Thank goodness we had physical shelves and physical items (tall boxes of cereal, short tins of oats, 14oz cans, 28 oz cans) to play with. Given how busy Gin and her colleagues are, and how many volunteer groups come and go, we knew we needed to leave behind something that clearly communicated our suggestions for improvement. Revisions and ultimately implementation would not be up to us – we were merely trying to be as helpful as we could in breaking down a problem in the three hours that we could spend at UMD. Verbally describing our ideas to Gin would have been insufficient. So we created not one but two deliverables. One was a representation of the new suggested order that looked like the original bulletin board – not spatial but merely hierarchical. I don’t have a picture of it, but it was basically our post-it notes all prettied-up. The second deliverable is what excites me the most, it’s the thing that we knew would articulate our ideas long after we were gone. 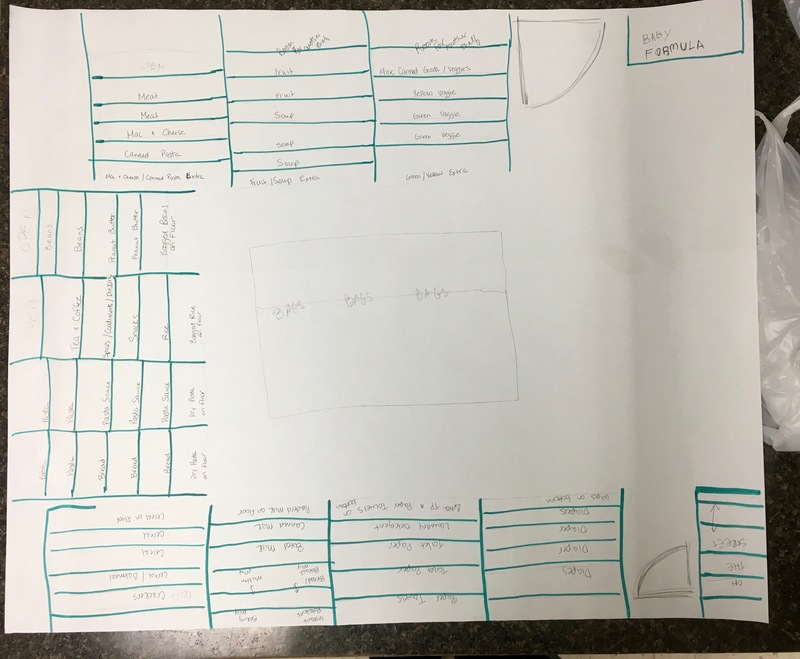 We created a sort of scale model / crude architectural drawing / layout map of the exact shelves and their location in the room and annotated it with ideas about what could go on what shelf. This visual representation could express order, placement, AND space allocation. Dare I say this was a wireframe? No blog post claiming to liken a non-software thing to a UX thing can hold its ground without some mention of feedback or testing. We did that too. In that, we showed the map to Gin and let her talk it out loud while looking at the actual shelves. Her verbal feedback confirmed acceptance criteria in some places and surfaced edge cases in others. What the ensuing conversation surfaced was the need for more storage space in the food pantry. You can’t add 20 new items to the same amount of space and expect it to work out. Especially the toilet paper and diapers, they take up a lot of space, and would be very annoying to have to constantly restock. 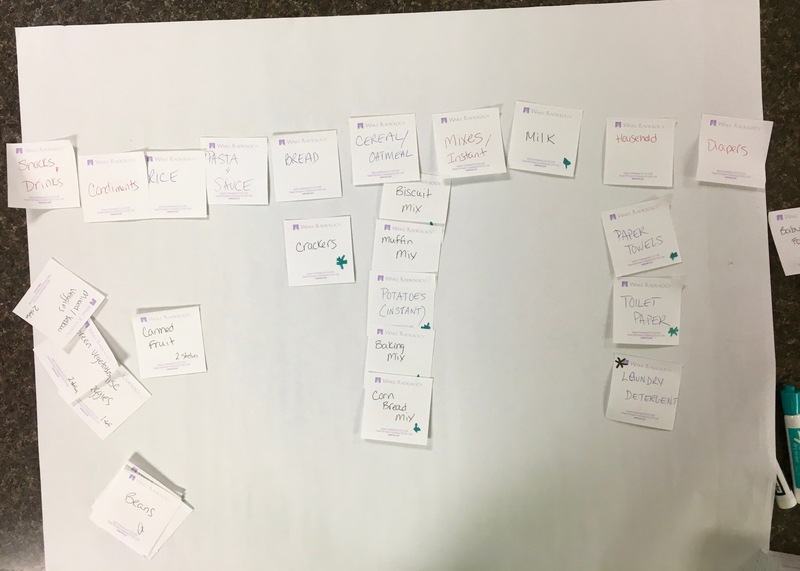 Perhaps Gin might have suspected this, but seeing the results of our exercise really made it clear how much the real challenge was going to be more storage space even more than working through change management with the volunteers. As we all sat and brainstormed, it seemed possible that a section of wall across from the refrigerators could be outfitted with shelves. And Gin admitted that no one really uses the bulletin board, so that wall could also be filled out with shelves. And because Rebecca is awesome, and kind, and a farmer, and a maker, she volunteered to build some shelves. I had a lot of fun going to Urban Ministries of Durham yesterday. Not that I disdain the usual tasks that can be done while volunteering there (making bagged lunches, sorting clothes), but it was novel and maybe even providential that a tech enthusiast and two PMs ended up doing knowledge work all afternoon. I hope Gin felt at least a slight burden lifted off of her shoulders with our attempt at a solution. It was fun documenting our process in pictures as we went along, but I write this post not to extol our volunteering virtues or shout from the mountaintops that I am some sort of IA expert. I do think, though, that this demonstrates that there is such a thing as “everyday UX” – finding design approaches in all things, not just in disruptive esoteric software startups.